It’s not so long ago I was happy to see much of the deer fencing being removed from the Mar Estate. 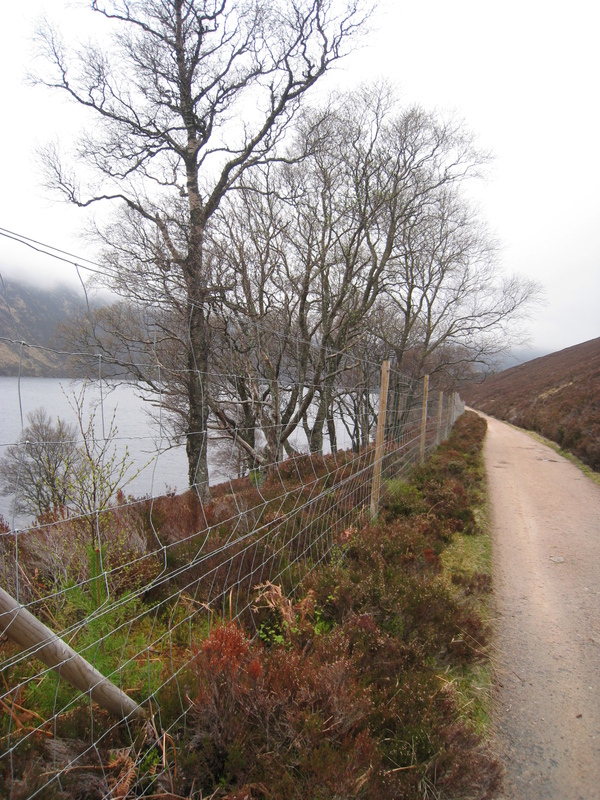 Leaving aside the fact that they were replaced by a giant electric mega fence – a development which may not have been entirely of Mar Lodge Estate’s choosing – it’s maybe worth taking a look at the origins of some of those fences. 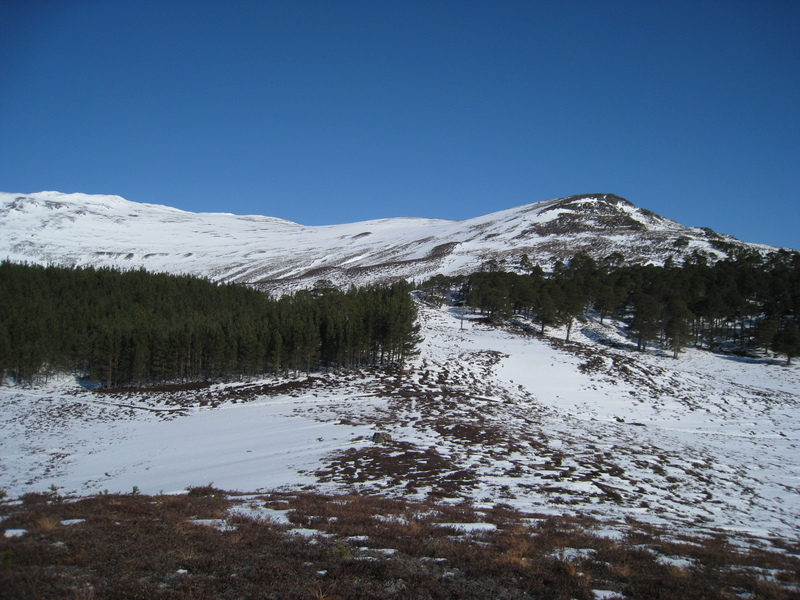 Back in the 1950s, when the Cairngorm National Nature Reserve was established, it was recognised that overgrazing by red deer was killing the forest, with new trees cropped to the ground as soon as they showed their heads above the heather. The Nature Conservancy Council recognised the problem but it was to be several decades before the estate came into the ownership of anyone prepared to tackle the problem in the most obvious way – cutting the deer numbers to a level that allowed natural regeneration. As with so many instances of vested interests fighting against the public good, it was even disputed whether the deer were causing the problem. These plots, fenced in 1956 and 1957, were tiny, ranging from 0.04 to 0.07 of a hectare but, in 1959 Malcolm was able to tackle a larger scale trial, encircling a whole hillock. 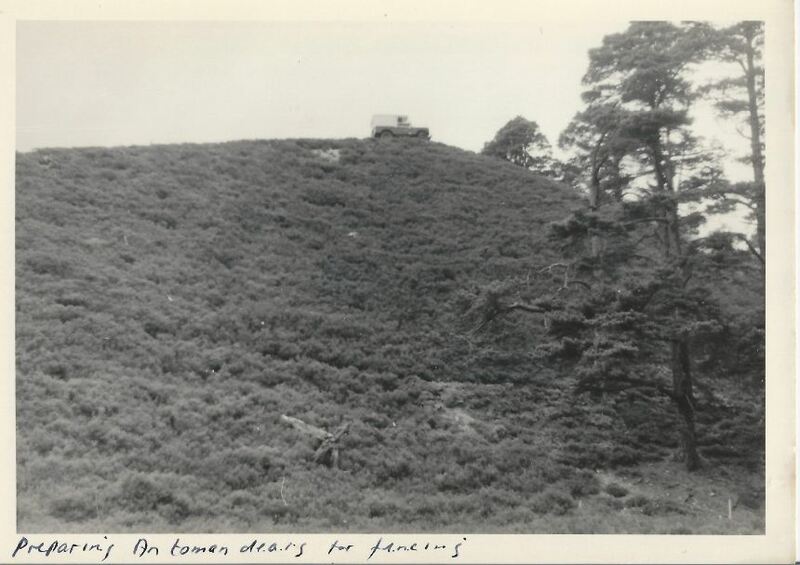 Tom Dearg (NO 042 943), meaning the red hillock (Malcolm remembers it as An Toman Dearg, which would be the plural) covered an area of 2.5 hectares, bare of trees save at the foot. I can recall passing the fenced-in hill in my childhood in the late ‘60s and, even then, you could see young trees shooting up thickly inside the fence. I remember, too, the small gate, which was set near the north-east corner of the boundary. The success of the experiment is plain to see today, even though the fence has been removed for a number of years now (possibly during the ‘80s or ‘90s?). Where Malcolm Douglas once parked his Land Rover you’d be hard put even to land one by helicopter, never mind drive it up there. Even climbing the hillock by foot can be a struggle. What Tom Dearg showed was that, with the deer excluded, the old forests of Mar were perfectly capable of regenerating. 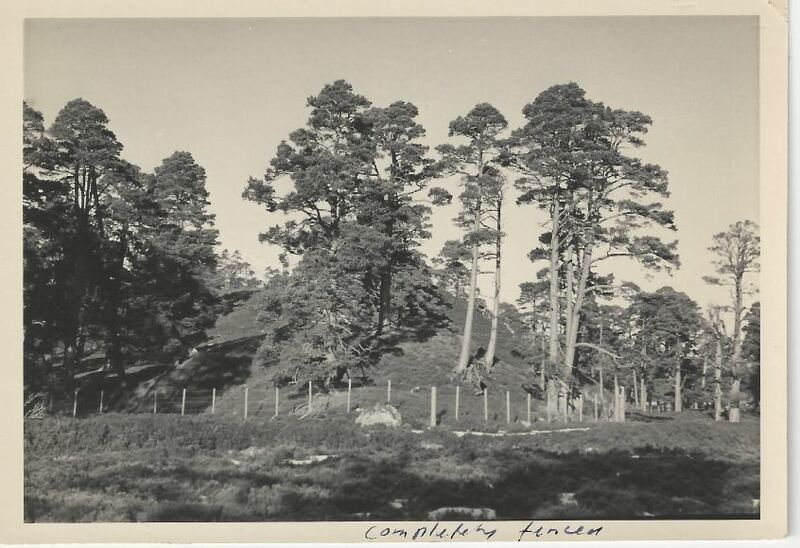 The following year Malcolm had three hectares enclosed beside the Lairig Ghru path opposite Luibeg Cottage (approximately NO 033 935). 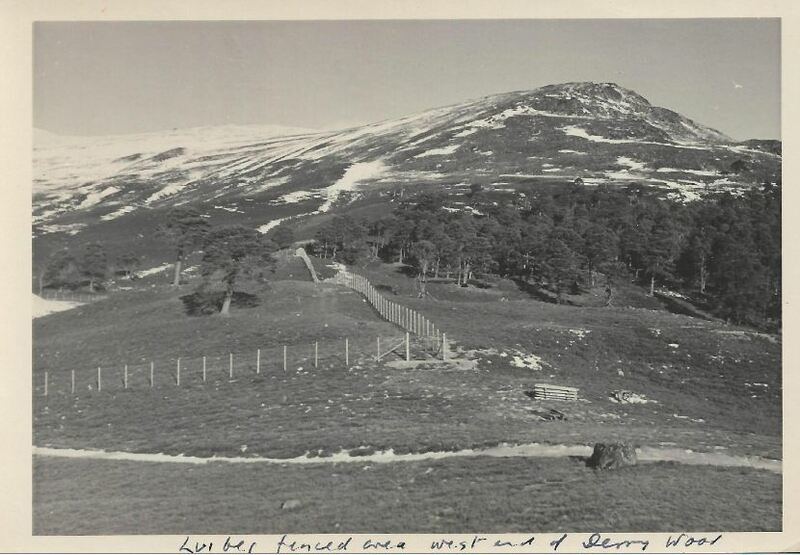 He also had a plot erected in Glen Geusachan, where he sowed pine seeds, but this was a failure: frost destroyed most of the seedlings and the fence was wrecked by stags, apparently as they scraped the velvet off their antlers, finding the larch fence posts ideal for the job. Can’t win them all. 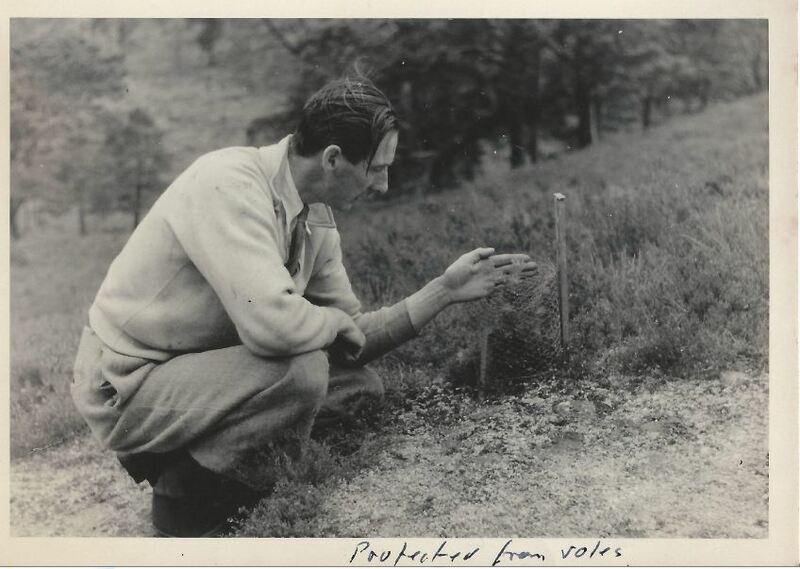 Malcolm eventually emigrated to New Zealand, where he continued his nature conservancy work, and experimental plots continued to be fenced off in the reserve, both in Mar Lodge Estate and in Glen Feshie. 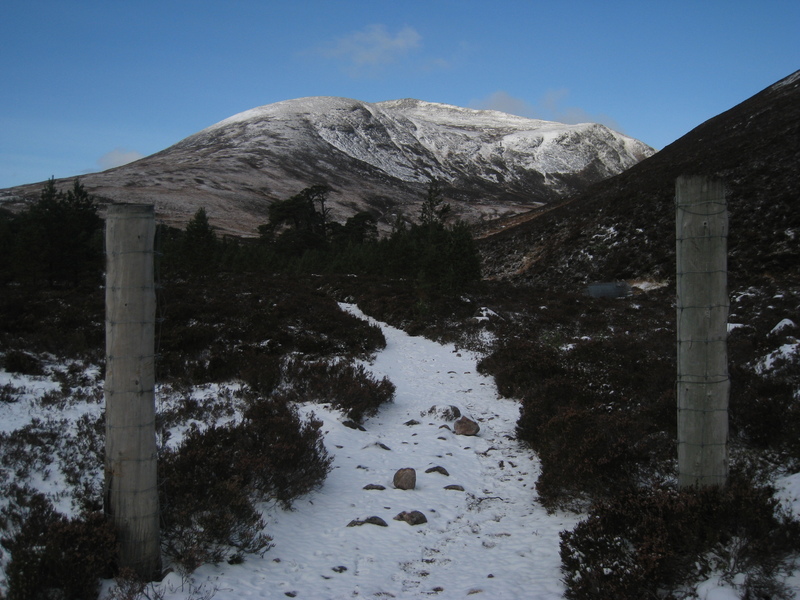 The most obvious of these, perhaps, was the large enclosure covering the whole Luibeg Bridge area, with deer-proof gates to allow walkers and climbers free access through to Glen Dee and the Lairig. This was only removed in the most recent purge of fences in the wake of the almost complete cull of the Mar Lodge Estate deer population. So, while many of the deer fences which have been such a prominent feature of the landscape were erected to protect Forestry Commission plantations, some of these played an important role in proving that native pinewoods could and would regenerate naturally if given the chance. 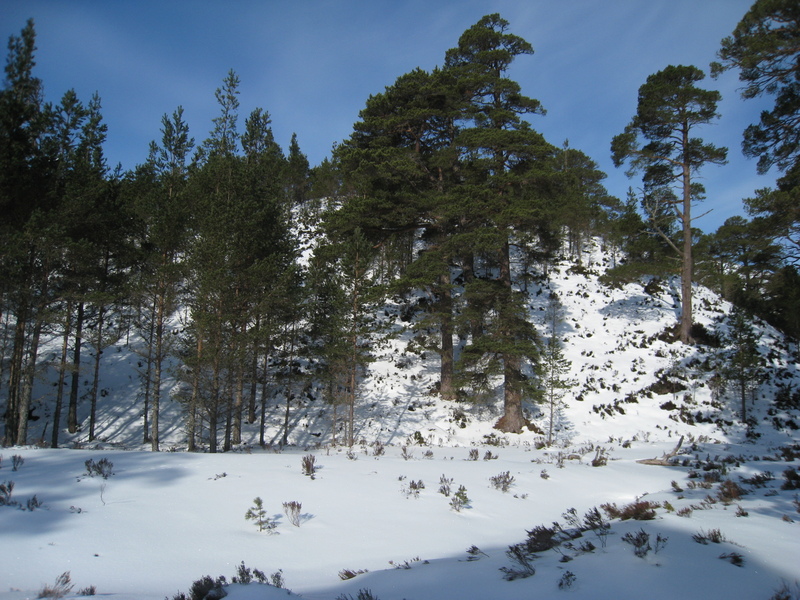 And, as I’ve stated before in this blog, that’s exactly what has been happening in Mar Lodge Estate since the National Trust has cut deer numbers to virtually nil over some areas. There are certainly those who argue that it was an extremist reaction and that a more gradual reduction in numbers to find a sustainable balance should have been undertaken. I have a degree of sympathy with those arguments – the hills seem empty without the deer – but what’s done is done and I hope that numbers will be allowed to gradually rise until that balance is found and a healthier environment is reached for all. A graphic reminder of the bad old days came when I visited Loch Muick a couple of weekends ago. 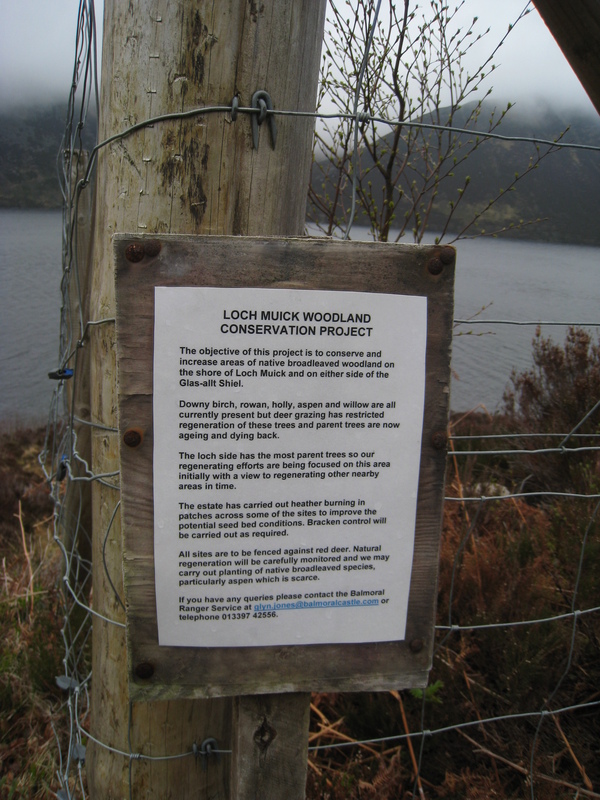 All along the Loch Muick shore were sections fenced off, signposted to indicate that this was “necessary” to allow regeneration of the native birch, rowan, holly, aspen and willow. The good news for Balmoral Estates is that it’ll work. The bad news for us all is that it will only work until they remove the fence. It’s time someone told Mrs Windsor that the real solution lies not in more unsightly, bird-killing deer fence, but in cutting the gross overstocking of deer which is destroying the land she claims to love. 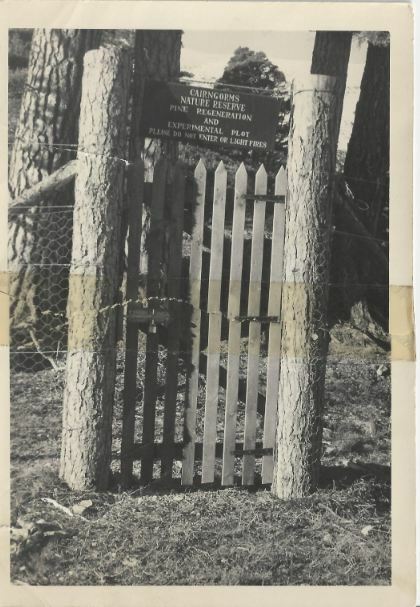 This entry was posted in History, Nature, People and tagged conservation, deer fence, Malcolm Douglas, nature reserve, pines, trees. Bookmark the permalink. 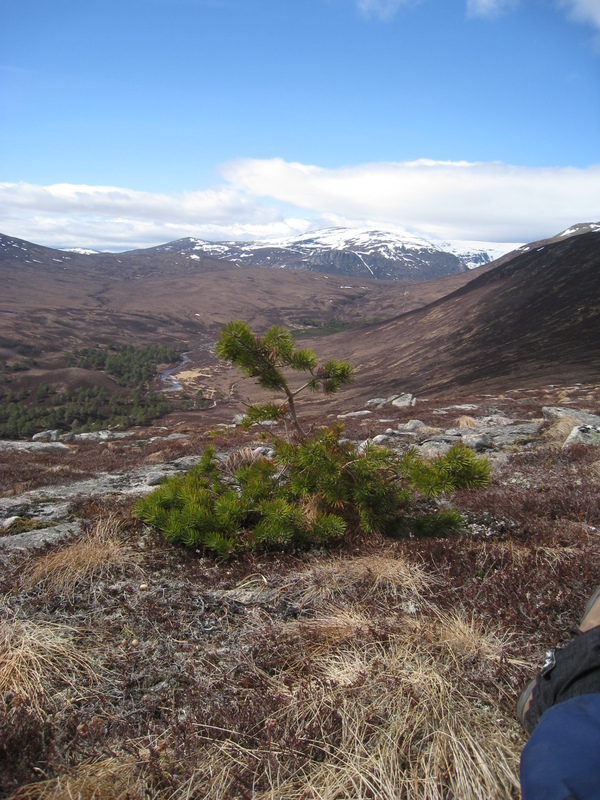 Excellent Neil, a fascinating history of the Scots pine management, probably a pioneering project by Malcolm. What a living testament to his work.. Cheers Tom, I thought you might be interested in that one. It was fascinating to hear from Malcolm and see his photos. As you so rightly say the area does seem empty without the deer these days. Experimentation is just that. Alas in my opinion the removal of the land rover track up the east side of Glen Derry is not one experiment that is succeeding. Frankly there was nothing wrong with leaving it to grow over and yet be used for vehicle access when required up that glen. Everything is cyclical or so they say. Can’t agree, Dave. No need for it (ATVs and sno cats can still get up if necessary) and the slimmed down version is nicer to walk on and nicer visually. The old jeep track there was quite a scar. Thanks for that Joe. The trees there now are certainly pretty uniform. Didn’t realise that about the electric fence though – it’s certainly not bonny.